If the saying ‘you are what you eat’ is to be taken as gospel truth, then Samoans are in big trouble. One must ask, shouldn’t being high on the world diabetic charts be a wake up call for Samoans? 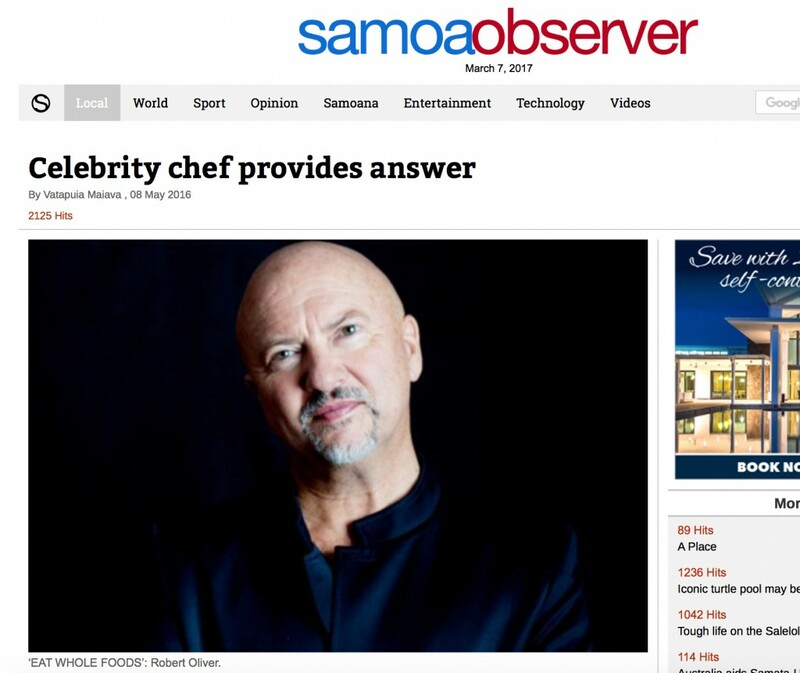 Renowned Chef, Author and TV celebrity, Robert Oliver, says the answer to Samoa’s diet problems is simple. “Samoa is second on the diabetic charts in the world, the answer to all these diet issues in Samoa sits in the original cuisines of Samoa and the dishes that our grandmothers cook,” he said. According to Mr. Oliver, simply cutting down on things is not the answer. “There is a lot of initiatives around staying healthy by cutting down on sugar and salt, but if you just go back to a system of eating whole balanced foods then you will take off all those issues,” he said. “That’s what Samoan original cuisine is, I’m not saying it has to be in its original form because cuisines change over time and people make their own different versions of the dishes. “But respect the foundation, which is food from the ground and not from the packages; If something has more than 7 ingredients in it then I would say run in terror.” Samoa has access to a large number of organic farms yet it is not taken advantage of. “My whole point is to simply go back to real whole foods, this country has a large number of organic farms and so the answer is right in front of everyone,” Mr. Oliver said. “You walk in the Fugalei market and you see all these beautiful food; the issue is also some mindsets, I was brought up in the pacific and we always think that everything from overseas is better but it’s just not. “You just have to live overseas to know that, I think if we go back to eating from the earth then Samoa will descend from the diabetic charts. Mr. Oliver feels that the government also has a part to play in this. “I would like to see things taxed here in Samoa; I know it’s a controversial issue,” he said. “I’m not a scientist or a nutritionist, but I have worked in the broad health scope for a long time now, I know New Zealand is being pressured to put a sugar tax on fizzy drinks because it’s the same as smoking. “Cigarette companies now fund their own wellness because it is heavily taxed, I don’t see why the same approach can’t be taken for food. Mr. Oliver urges Samoa to start thinking of what you put in your mouth. “Please people of Samoa, eat local foods, you have niu so you don’t need fizzy drinks,” he said. “The answer to good health, good economy and good identity is sitting everywhere around you, in your farms, in your kitchens and in the food your grandmothers cook.